Create your very own movie theater in your backyard with our Dart Board Movie Screen. You can have a big screen movie experience without having to leave your home! 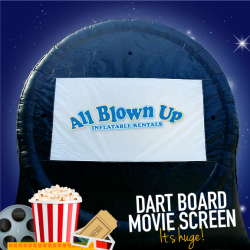 Large professional inflatable movie screen with HD projector. Add on sound equipment for the full experience! Foot darts not included in this rental. This rental is movie screen and HD projector only.